Uhrwerk (German for clockwork) is yet another great puzzle from the family of sequential movement, which is a type of puzzles usually made by Jean Claude Constantin, and very well made, I might add. This beautiful contraption is sure to capture the attention of anyone because of its eccentric and unusual design. One of the things that pops right out of this incredible design is its size. 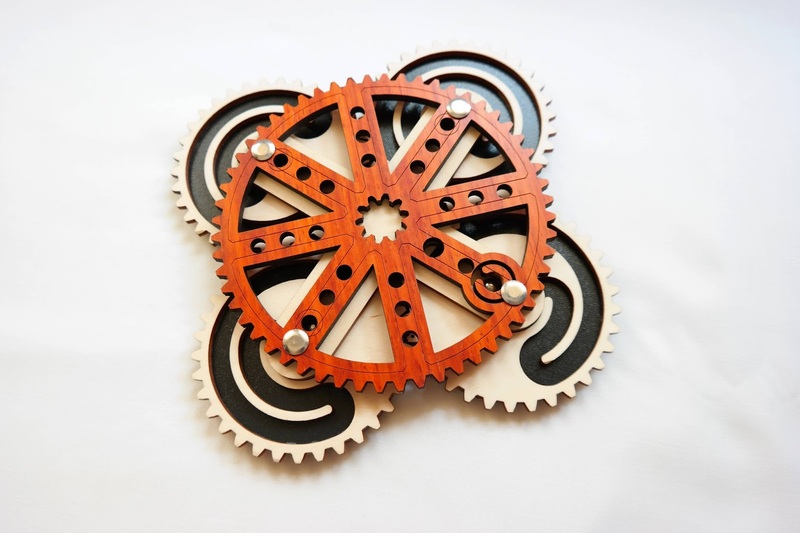 It measures about 21cm diagonally and features four big cogs placed at each corner. The material used is laser-cut wood, which is easier to work with, especially due to the small dents of the cogs. The movement of the puzzle is smooth and works flawlessly. The design of the puzzle, which by the way, doesn't look like a real puzzle at all, but something from the mind of Leonardo da Vinci, is in itself a masterpiece of craftsmanship. The four wheels, or cogs, or discs, whatever you want to call them, work simultaneously if you rotate just one of them. Carved in the face of the wheels is a winding path that's being navigated by four small metal spheres. Your goal, however, is to free just one of these spheres (there's a larger hole in the frame), since the other three are there just to make your task a bit more difficult by blocking some of the movements. This puzzle is quite difficult to solve, because it has a large number of movements required to free the sphere. The level of difficulty is 9/10, so this is a big challenge for the more experienced fans. The movement of the puzzle is classified as 3-ary (ternary, because of its three states). Solving it requires utmost concentration, as you need to pay attention to how the wheels turn and to keep the spheres in the correct path. It takes a while to get used to the movement of the puzzle and to find the correct sequence, but once you do it's easier to solve. Uhrwerk by Constantin is a magnificent puzzle. You can play with it without even trying to solve it, just playing with the movement. To solve it, however, you should be an experienced fan, otherwise it can be extremely frustrating. Availability: You can find the Uhrwerk puzzle at Brilliant Puzzles for $34.95 USD. There are also many other interesting designs from Jean Claude Constantin.